Rawson Marshall Thurber goes inside his first big-budget action film, working with Dwayne Johnson, and their next collaboration, Red Notice. Dwayne Johnson achieves the action trifecta as Skyscraper delivers one huge summer popcorn spectacle. Two new Skyscraper posters pay homage to the movies that inspired The Rock's new blockbuster. 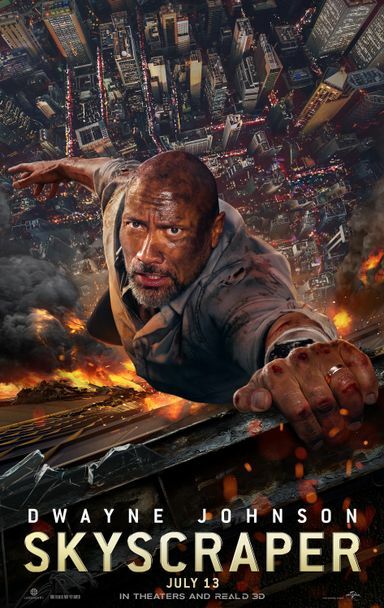 Dwayne Johnson faces his biggest challenge yet when he must save his family from a towering inferno in Skyscraper. We have a new look at Skyscraper, which reunites Dwayne Johnson with director Rawson Marshall Thurber. Dwayne Johnson channels his inner John McClane in the new trailer for Skyscraper. The latest look at Dwayne Johnson's Skyscraper has the action star literally clinging on for life. We have every single movie trailer that debuted during Super Bowl 52 during NBC's telecast live from Minneapolis, Minnesota. Dwayne Johnson takes flight, leaping from a crane into a burning building in the first poster for Universal Pictures' Skyscraper. Get your first glimpse at Dwayne Johnson as a security expert tasked with assessing the world's tallest building in the Skyscraper Super Bowl preview. 10-year old hero gets invited to the set of Skyscraper to hang with The Rock and eat candy. A bloodied and battered Dwayne Johnson shares a new video and photo from the third week of production on Universal's Skyscraper, arriving next summer. American Gods star Pablo Schreiber has signed on for an unspecified role in Dwayne Johnson's action-thriller Skyscraper. Neve Campbell has signed on for an unspecified role alongside Dwayne Johnson in the Universal Pictures action-thriller Skyscraper.